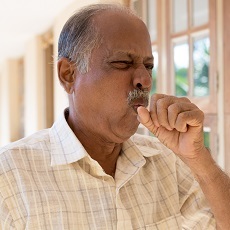 Chronic bronchitis is one type of COPD (chronic obstructive pulmonary disease). The inflamed bronchial tubes produce a lot of mucus. This leads to coughing and difficulty breathing. Cigarette smoking is the most common cause. Breathing in air pollution, fumes, or dust over a long period of time may also cause it. To diagnose chronic bronchitis, your doctor will look at your signs and symptoms and listen to your breathing. You may also have other tests. Chronic bronchitis is a long-term condition that keeps coming back or never goes away completely. If you smoke, it is important to quit. Treatment can help with your symptoms. It often includes medicines to open your airways and help clear away mucus. You may also need oxygen therapy. Pulmonary rehabilitation may help you manage better in daily life. Article: Alternative definitions of chronic bronchitis and their correlation with CT parameters.